Remember that old childhood favorite–Pass It On (or Telephone, call the game what you will). 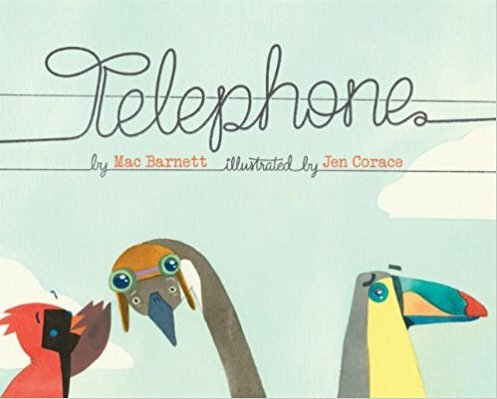 Mac Barnett has taken that and made a picture book that cries to be read out aloud, again and again. Jen Corace's clear bold illustrations do not in any way distract from the words being passed along; rather they enhance the story in subtle ways. The birds are the messengers in this story. The first spread shows the birds silhoueted on the telephone wire. Nice touch indeed: sitting on the telephone wire playing the game Telephone. We see a typical neighborhood where kids abound and pets are not lacking either. "Tell Peter: fly home for dinner." Mama bird tells the young tweet. Notice what the young'un has on his shoulder. "Tell Peter: Hit pop flies and homers," is the message he passes on. One of the messages of the book, so subtly delivered, is that our interests shape our actions and reactions. So the baseball fan hears game lingo. Which he tells the next bird, a flying fanatic. The pictures anticipate the words, creating a sub-text that can be turned into a fun game. The rules are set. This is the game of telephone where a message is passed from one to another, and we know it will get distorted in each passing. We have seen, with the first two spreads that the speaker does not hear accurately what is spoken but rather what his interest is, what he most wants to hear. An important life lesson. The great thing about Mac Barnett's books is that the reader is not bludgeoned with the lesson, or moral of the story. It just kind of slips in; at the end the reader has realized something about life, or not. It depends on the reader. Let's play along. The aviation buff will hear something related to flying. Turn the page: "Tell Peter: prop planes are for fliers." The page turns are pure genius. Mac Barnett's pacing is impeccable. And so the message wends its merry way. The reader can play the game two ways: hide the picture and guess the words, or hide the words and guess the pictures. By the time the message reaches wise Owl it is changed beyond all recognition, and is a paragraph long. Read it aloud without pausing to draw breath. Hear the drama behind the words. There is the wonderful full-page picture of Owl cogitating on the words. Then he turns to Peter and says—well you'll have to turn the page to find out. The story comes full circle. We're back to the neighborhood of the first spread, but the activities are different.